Mark Cooper started his career as a wood pattern-maker and for the last fifteen years has perfected the art of traditional English longbow making. He is a manufacturer of custom-made six foot longbows, arrows, and targets, and a supplier of all the necessary equipment for the practice of the sport of archery. Mark runs workshops teaching the technique of construction for bows and arrows, as well as public events demonstrating how to shoot the longbow in a safe and enjoyable way (with visitors able to have a go with a real longbow for a small fee). 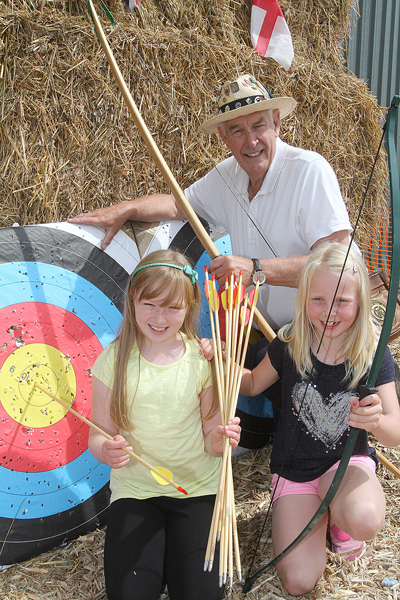 He also enjoys giving public talks about the history of archery. As a member of the British Longbow Society and the learned Society of Archer Antiquaries (the body charged with retention and cataloguing of all archery related material) he has written many articles on the sport of archery, and has re-published the 1628 rules of archery called ‘Ayme for Finsbury Archers’ originally by James Partridge.